If you have a barn, horse stable, or can otherwise provide a relatively safe, comfortable home for a feral or unsocial cat, or a cat who for some other reason may not be a candidate for placement into a traditional indoor home, please let us know! 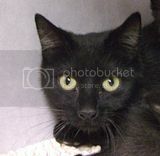 IMHS will waive the adoption fee on cats we seek barn homes for. All feral cats will be sterilized and vaccinated, and ear-tipped when possible (for identification). 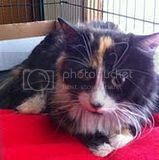 Adopters of barn cats must be willing to properly acclimate feral cats to the new environment (IMHS will provide instructions and necessary caging), and commit to ensuring the ongoing care of the animal(s) to include providing fresh cat food and water daily, protection from the elements, and ensuring medical care. For information on adopting a barn cat, call IMHS any day at 303-838-2668. Thank you for spreading the word, and thank you for your compassion for animals! See the view from our Second Chance Thrift Shop on our 285Bound Webcam! Abby... Originally dubbed "Tapioca", Abby is now finding refuge in a foster home with a caring person who is working with her on social skills. She needs a permanent home--please spread the word! Thanks for spreading the word about Abby and Minnie!